A slightly delayed reveal post this month, I’m afraid! Last month’s Foodie Penpals scheme saw me sending a parcel out to Vita in Lithuania (you can see her paleo diet-focused blog here, with some posts in English), while my parcel came from the lovely Clare of Bristol-based blog Flake and Cake – a blog all about food and other general musings! The first thing to be eaten was the Nakd bar – a snack from a company that produces healthy bars made with fruits, nuts, spices and nothing else! 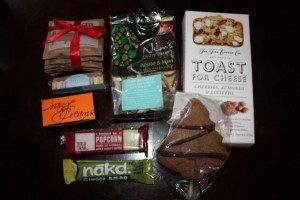 Clare sent me the gingerbread variety, which I’d not tried before, a great start to the festive season! It also didn’t take long to get through the Wild Trail bar, another snack bar with a popcorn base, made by a company based in Dorset. I’m trying to restrain myself from eating the orange creams, made by Bristol-based chocolatier Guilberts – they’re so good! I haven’t been so restrained with the local fudge, though, which is beautifully buttery and crumbly. Nim’s fruit crisps have only recently begun to be stocked in Bristol, and I’m looking forward to trying the apple and kiwi variety that Clare included, they’re going to be set aside for a healthy mid-afternoon snack for work! The Teapigs chocolate flake tea looks intriguing, I’m waiting for the boyfriend to give his verdict on this, as I’ve sadly given up caffeine, but I’ll definitely have a sip. As massive cheese fans, we’re also really looking forward to trying out the “Toast For Cheese” from Bath-based The Fine Cheese Co, which includes cherries, almonds and linseeds and is apparently a great pairing with rich blue cheeses. Thanks for an amazing parcel, Clare – and I hope you enjoyed your first month as a Foodie Penpal!